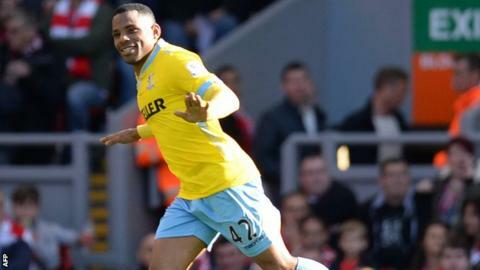 Jason Puncheon and Scott Dann are good enough to represent England, according to their Crystal Palace boss Alan Pardew. Dann, 28, was voted player of the year at Selhurst Park last season and the centre-back signed a new five-year deal with Palace in July. Midfielder Puncheon, 29, scored six goals last season. "They have that confidence, they are top Premier League players and could play for England," said Pardew. Speaking before Crystal Palace's match at Aston Villa on Saturday, Pardew had particular praise for former Southampton player Puncheon. He added: "There's five or six players in this squad who could get into their squad, but Puncheon and Dann lead the way in terms of where they are. "Puncheon is underestimated by a lot of people in the game, he is somebody I know for sure is better than players who have played for England." DR Congo winger Yannick Bolasie has been a target for London rivals Tottenham throughout the summer. "If any of my players get linked to bigger clubs I wouldn't expect them to ignore it. It would be a foolish move," said the Palace manager. "You have to keep your options open and I have no problem with that. "The option I want is that he's a Crystal Palace player who is loved by our fans and loved by the management team." Another player linked with a move away from Selhurst Park is striker Glenn Murray, with Bournemouth reportedly interested in the 31-year-old. But Pardew feels Murray should stay loyal to the club who gave him his chance in the Premier League after he returned from a nine-month spell on the sidelines with a knee injury last year. Pardew added: "I was the one who brought him back from loan at Reading and gave him the games. So as much as we owe Glenn he owes us for the platform we have given him." Pardew also said striker Dwight Gayle is likely to leave despite turning down a move to Championship side Bristol City.